The best Shoney's Strawberry Pie recipe. Shoney’s Strawberry Pie is one of the most loved menu items at Shoney’s. The Shoney’s Strawberry Pie for always signals spring. In the spring strawberries are fresh and so ripe. 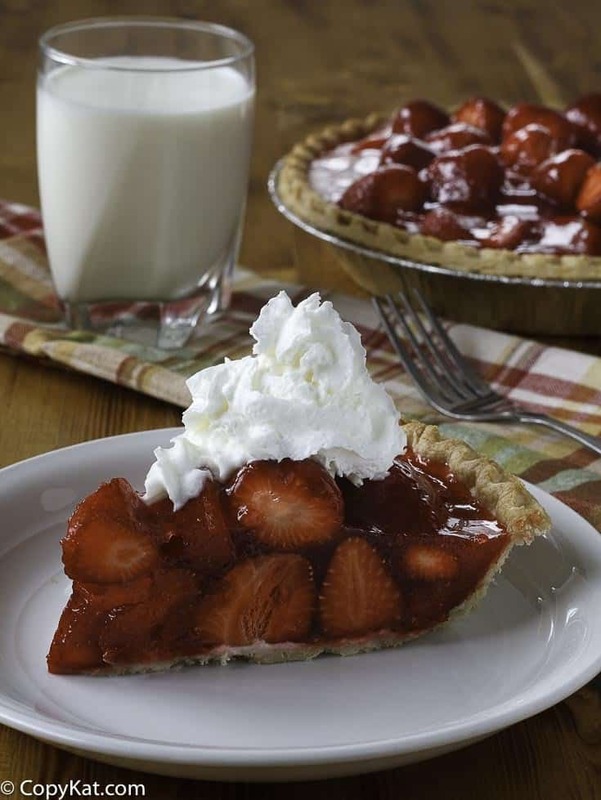 Shoney’s Strawberry pie is a great way to use fresh strawberries. Who doesn’t love this classic Strawberry recipe? Shoney’s is known for their strawberry pie. The copycat recipe for Shoney’s Strawberry Pie is easy to make and has ingredients that you already have at home. Who doesn’t easy to make pie? This recipe is made simply with strawberry jello, cornstarch, sugar, and fresh strawberries. You can use a frozen pie shell for this recipe that you bake in the oven before you make this delicious dessert. After the pie sets up you can choose to decorate it with whipped cream or simply leave it as it is, the colors of the strawberries are simply beautiful. You really can make this pie in no time. My favorite time of the year to make this pie is the spring, the Strawberries are just starting to come in, and it doesn’t get better than this. Unfortunately, Shoney’s isn’t around as much as they were in the years past. So you can recreate this famous dessert at home with this recipe. If you love other Shoney’s desserts be sure to check out the Shoney’s Hot Fudge Cake Recipe. I know you will love that one too! Make your own copycat Shoney's Strawberry pie at home. Blend sugar, cornstarch, and water together in a medium-sized pot over medium heat. Cook stirring occasionally, until the glaze becomes thick. You will know it is thick enough when it can coat the back of a spoon, and the glaze will slowly come off the spoon. Add Strawberry Jell-O. 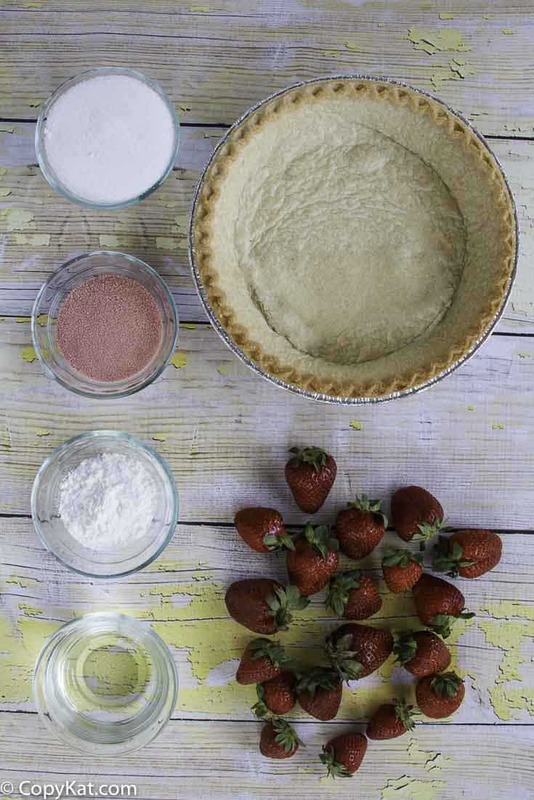 Place drained whole fresh strawberries into baked deep-dish 9-inch pie shell. Pour cooked mixture over berries. Chill 2 hours at least. Have tried this many times. My family loves it. Fresh Strawberries makes it even better. If you have a problem with it not getting thick add 1 teaspoon extra of corn starch. As the glaze cooks it becomes clear. You need to use regular jello, not sugar free!!! I worked at Shoney’s through high school back in the 80″s. I waited tables and made the hot fudge cakes and strawberry pies. It is true what another former employee said about not using jello, they did make it with “strawberry glaze”. It came pre-made in a big tub…BUT…unless you can buy that pre-made “strawberry glaze”, you will need to make your own and it is indeed made with strawberry gelatin, aka…strawberry jello! I grew up in West Tennessee and you can buy that pre-made glaze in the produce department in grocery stores next to the fresh strawberries. It’s sold in a clear bag. I live in North Jersey now and no such product exist in grocery stores here so I use this recipe and it’s perfect and exactly the same thing! P.S.- The pie shells we used were just plain old frozen pie curst in the aluminum tins that you get at the grocery store in the frozen food section. Poke holes in bottom of thawed crust before putting it into the over to bake. 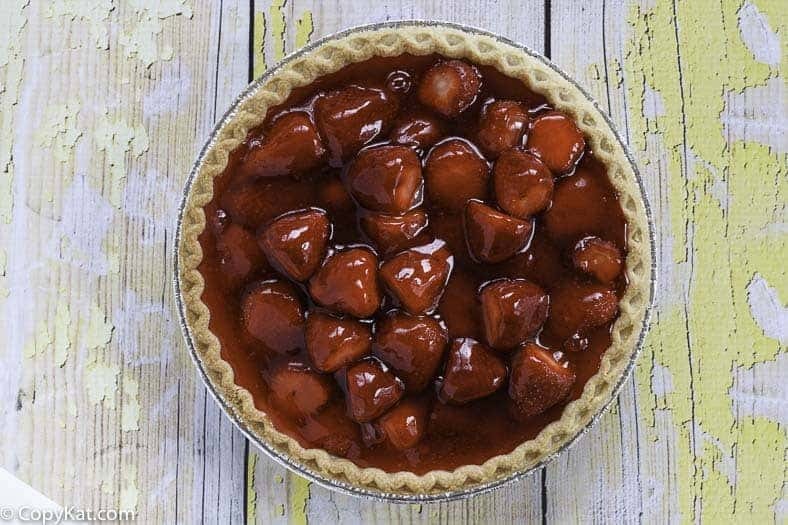 Don’t over bake, take out and fill with strawberries and glaze! That’s it! The hardest part of making those pies was topping the greens off of the strawberries and Shoney’s had their own technique for that as well. Use a grapefruit spoon and simply core out the greens making sure to get that “core” out as well. 7-up came into no place in this recipe as far as Shoney’s was concerned, never happened! You know I remember the Strawbery glaze used to be in grocery stores. found this recipe on line today and was excited to see West Tennessee…..that is exactly where I live. I am making this pie now. Hope it turns out as good as Shoney’s. I hope you enjoyed the pie. I imagine the strawberry glaze was pre-packaged in used it Shoney’s for convenience of time .. however however her recipe would be correct for making a strawberry glaze from scratch .. about to giveEllen this recipe a try.. Thank you Stephaniemanley you are the best, love all your recipes ???? I don’t know if it’s like Stoney’s or not butttt it surely sounds delicious & I think I’ll make it. Have a blessed day. Ok, back to the almost pudding instruction. Cook on low/medium/high heat? Stir or leave alone? How thick is almost pudding stage? Do you cool it? This sounds awesome and I can’t wait to try, but who writes these recipes??? Take a look at Pioneer Woman’s recipes and get back to us! I will edit the instructions. Let me know if I should email them to you. Thank you for the suggestion that I should read the Pioneer Woman’s recipes, and get back to you. Do you want me to email you? Thank-you for this recipe, it may not be the exact recipe Shoneys used but it’s fast, easy and tastes identical! Strawberry pie is my favorite but I always thought it would be such an ordeal to make, not so with this recipe! Love it! Thanks!???????? I am glad you enjoyed the Strawberry pie. I would really appreciate a recipe for the crust on Stoney’s strawberry pie. That is what makes their pie so special! Cut butter into small cubes and put in a mixing bowl. Add sugar and egg yolks and mix thoroughly using hands or electric beater. Combine flour and salt in flour sifter. Sift this gradually into the yolk mixture. Add just enough water so that the mixture holds together, Shape the dough into a flat cake and wrap in waxed paper. Refrigerator for half hour or until thoroughly chilled. Roll out on very cold surface. Shoney’s pie crust is thicker and sweeter than a regular pie crust – does anyone know how they do it? When I make it, I use the store bought shortbread crust. I haven’t been to a Shoney’s in decades but the crust reminds me of of the taste. You should be able to find it in the baking aisle, I think it’s Keebler. Every time I show up at work with this pie pandemonium ensues! I am constantly getting strawberry pie hints when it has been awhile since the last one. Big big hit!!!! That is a nice problem to have ! I worked for Shoney’ s for 8 years and we DO NOT USE JELLO! We use strawberry glaze. This site knows nothing about Shoney’s pie recipes. What do they mean by almost pudding stage. Who makes pudding anymore? Wish recipe writers would be ultra specific since my generation didn’t grow up with a mom in the kitchen. It means kinda thick, like pudding. Does that help? Or until the mixture turns cloudy to more clear. Oh my goodness. I tryed this recipe and let me tell you honey it is wonderful. It tastes identical to the original Shoney’s pie and it is super easy to make. LOVE LOVE LOVE this recipe!!!!! !